One of the most fascinating islands in the lake Titicaca are the famous floating islands made out of reed – the Uros islands. They are also perhaps the most visited of Titicaca’s islands, being so close to the mainland. The people living there has an interesting culture and traditions, but there are always pros and cons in the raising tourism industry. Puno is pretty ugly town overall, but there’s one reason why people come here, and it’s the convenient location at the shore of the great Lake Titicaca. According to the old Inca legend, the all-god Wiracocha rose from the Lake Titicaca to create the world and to tell the sun, the moon, and the stars to rise to the skies. Then he also created the first humans. This is why the Lake Titicaca is the birthplace of the Incas, and that is where their spirits return after they have died. Reed islands and houses at the Uros Islands, Lake Titicaca, Peru. Because Puno is located on the shore of Titicaca, it’s very easy to do some island hopping to the many islands of Titicaca. You can go for tours that’ll take several days and spend the nights on the islands, or you can take just day trips and stay the nights in Puno. Puno is full of tour companies so you will definitely find something that suits your schedule. Just don’t fall into the “offers” of the predators attacking you when you arrive at the bus station! Though they will offer you very cheap tours, these are the worst kinds of the tour companies available! Low prices always come with the nasty side that the local island communities rarely benefit from the tourists’ visits at all. Instead, all the profits will stay with the tour company. So use some time and effort to examine and searching for the most responsible tour companies! One of the good companies is called Edgar Adventures from which we bought our island tour. They have double prices compared to those offered to you at the bus station, but it’ll be worth it because you’ll know that at least some of your money will also go to the native island communities. There are also other responsible companies. 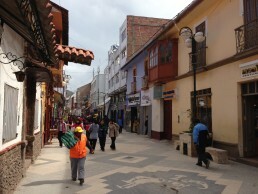 Just do a bit of searching around in Puno. Edgar Adventures had tours of various prices depending on the boat used on them. A whole day tour with the fastest boat (called ”speed motor boat”) for two islands of the Islas de Uros (the famous floating islands made of reed) and the island called Taquile located further away cost 55 USD/person. We ended up choosing this one. 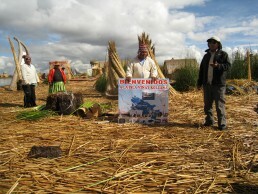 Arriving to Quechua, the main island of the Islas de Uros, Lake Titicaca, Peru. 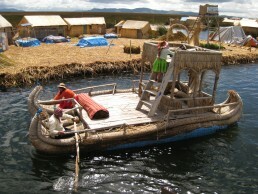 Visiting Uros Islands on an Organized Tour or Independently by Public Transport? We would have wanted to go to visit the islands independently without an organized tour. 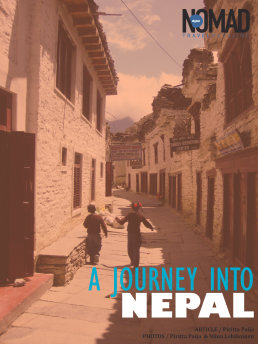 We searched for information on how that could be done by asking the locals and surfing the internet but came to the conclusion that with our tight schedule that just wouldn’t be an option. It’d have taken more time than we had to spend. There are ”Colectivo” –boats going back and forth on most of the islands but they are also quite slow. They also may not run every day and/or regularly. For example, a colectivo boat from Puno to Taquile takes 3,5 hours, one way, and it stops for only 30 minutes on Quechua, which is the main island of Islas de Uros. So a return trip from Puno to Taquile would have taken 7 hours altogether. And this is just the traveling time by boat. Therefore there’s just no sense using them unless you have multiple days to spend. But if you do, you can take a colectivo boat first to Quechua and spend some time there and then move on to the other reed islands before catching the next colectivo from Quechua to Taquile. In this option, you’ll have to spend the night on Taquile, because you won’t be able to take a boat back to Puno on the same day anymore. Unfortunately, we didn’t have enough time to go by the ”one island per day” –plan, which we would have preferred. So, this time, we had to take an organized tour instead. By our tour operator, the group sizes are kept small so it was a bit more bearable. However, on the same boat with us were also people from other tour companies, so it was a shared boat. Fortunately those people left off on a different island at the Islas de Uros than we did. We can understand Spanish pretty OK, and all the other people in our group spoke very fluent Spanish. Our guide also spoke very fluent English so we preferred that he’d tell us the stories in English. This way it was also a nice practice for our Spanish; first listening to the Spanish version of the stories and seeing how much we actually understood, and afterward hearing the same story in English. 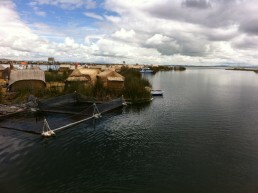 Islas de Uros are perhaps the most famous of Titicaca’s’ islands because of what they’re made of. They are made completely out of dried totora reed. These reed islands are also thoroughly man-made islands. Nowadays there are about 50 of them altogether when at the beginning there were only a few. The purpose of the island settlement was initially defensive; if a threat arose they could be moved somewhere else. The people living on the floating islands are called the Uru (Uros) people, and they form three sub-tribes: Uru-Chipayas, Uru-Muratos, and Uru-Iruitos. The latter are located on the Bolivian side of Lake Titicaca. The totora reed grows in the lake and the dense roots that the plants develop and interweave, form a natural layer called khili. It’ll grow about 1-2 meters thick and that supports the islands. These ”lumps” are then anchored with ropes attached to sticks assembled into the bottom of the lake. We were given a demonstration of how the construction is done by our islands’ Mayor. The bottom reeds also rot very quickly so new reed has to be regularly added on the top – at least every three months. It’s a funny feeling, walking on a reed island. Every time you take a step your foot sinks many centimeters into the reeds’ surface because it’s so flexible. 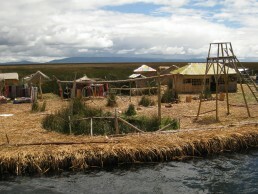 The Uros build their islands and houses of reed but also their diet and medicine include lots of it. For example, when a reed is pulled, the white bottom is often eaten for iodine, and this prevents goiters. We were also given a chance to eat the lower end of the reed, and it tasted somewhat acrid though fresh. This white part of the reed is called chullo and like the Andean people of Peru rely on the coca leaf for relief from the harsh climate, hunger, etc., the Uros depend on the totora reed. It can also be wrapped around a place in pain to absorb it. And if it’s hot outside you can roll the white part in your hands and split it open, then put the reed on your forehead, and it feels very cool to the touch. And the white part can also be used to help ease hangovers caused by alcohol! You can also make reed flower tee. So it’s a very versatile plant indeed. But even though the reed is a primary source of food, the Uros also graze cattle on the islets. We saw some small islets where cows were hanging out on it. And they have local domesticated animals like the Ibis bird for laying eggs for human consumption. Besides these foods produced by themselves, they also get supplies from the mainland from Puno. The president of the island is telling us how the islands are made. After the building demonstration, our tour continued. We were all taken by some of the locals to see their house and to see the handicrafts they make. This is a point where you’re expected to buy at least something even though it’s not mandatory, of course. Then there was a ride on a ”Taxi” reed boat (but that’s not included in the tours’ price. It was an additional 20 Soles/person. A bit much, yes.). And after the ride, you’ll visit the main island called Quechua. It’s the place where your accommodation will be if you want to spend a night, and there are also a couple of restaurants and souvenir shops. But frankly, it didn’t seem like a very appealing place to stay overnight, neither comfortable. Because naturally, it’s very moisture everywhere and the smell of mold is everywhere. One of the downsides is that nowadays the islands are so infiltrated by tourists that it almost felt like ”a tourist show” and not that they’d be real people actually living there. Also, the Lonely Planet’s guidebook mentions that some of the Uros actually may live and sleep in the mainland and just come to the islands for the days to maintain the tourist business. I guess some of this is true, but I also think that maybe the majority of the Uros actually do live on the islands all the time and live their traditional lifestyle. 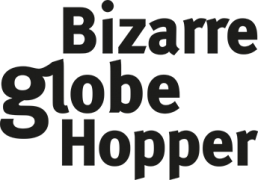 However, the more tourists there’s going to visit, the more their traditional lifestyle will start losing its authenticity. They’ll begin to live more and more by the rules of the tourist business. Which will be natural considering of how much of their livelihood will come from the tourism. A sad fact actually, if you think about it. So I’d say that if you want to visit the Islas Flotantes de Uros, you should go as soon as possible. Then you may still have some feeling of authenticity. After all, it’s a very unique place to see and experience. And even though it might feel that they’re obtruding to you all kinds of souvenirs they make, I’d still suggest that you would buy something. 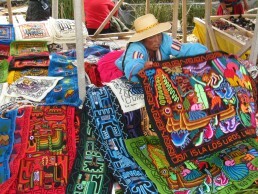 Firstly because you can be sure that that money of yours will at least stay with the Islanders, and secondly because the hand embroidered handicrafts that the Uro women do and sell to the tourists are actually gorgeous! The woman from whom we bought our beautiful embroidered wall cloth resembling the Pacha Mama deity, told us that it takes almost three months(!) altogether to do the embroidering by hand. The stuff they sell isn’t actually cheap but for once it felt like you’re still not ripped off. Even if it’s not taking as long as three months, it will still take a long time to make something like that by hand. So at least I am happier to pay a bit more for something like that.  It’s a once in a lifetime experience to visit these famous floating islands. It’s also worth the journey if you just take the most of it despite the feelings of inauthenticity which you may occasionally feel. 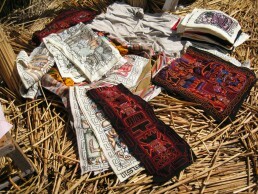 Handicrafts of the local women they sell to tourists. Emroided handicratfs done by the Uro women. Celebrating the biggest festival of the year in Puno, Peru - the Virgen de la Candelaria. 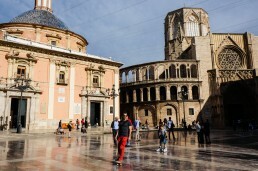 The streets are filled with music, dance performances and parades for almost 24/7. Join in with the devils and other strange creatures! 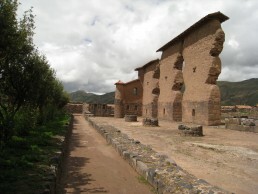 You can see many Inca ruins and little town while traveling via the Wiracocha Pan Andino highway from Cusco to Puno.